Well, that made headway rather quickly after becoming public knowledge! Remember all the dramatic superlatives our community bandied about a few years back when it was deemed an imperative to reorganize the Art Theater as a cooperative so shareholder purchases could possibly “save the independent cinema” in Champaign-Urbana? A shift in prerogatives and future goals has emboldened the Board of Directors (BOD), general manager Austin McCann, and participating shareholders to choose yet another operating path for the Art, agreeing by vote to allow a local and heretofore low-key organization called the Art Film Foundation (AFF) to bring the movie house under its wing. As a not-for-profit (NFP) group, the AFF will provide the theater with the means to pursue fundraising options, which had not been a possibility due to its prior co-op status, for beefing up its programming slate and building improvements. Certainly, they are banking on the addition of grants and tax-deductible donations to regular ticket sales and annual memberships to provide the Art a better-than-before operating budget. This is all well and good – why wouldn’t we want the Art to continue its long-term recovery? – but we do wonder if this will give select tastemakers more latitude to become pickier with their scheduling and, even more so, suggestions to their new parent organization on which screenings and events to throw said moneys behind. Since we are at the very beginning of repositioning the Art as something inherently new, even with a pledge in the press release below to not change their daily business acumen, we should give them time to resettle. As the public conversations commence over this development, be vocal about what you want to watch at the Art and make sure to verbally support your local film festival for local film artists in the process. Yes, it’s an imperative. p.s. Presumably, the URL to the Art’s Web site will be changed to remove “coop,” so Google them if you find the page links here to be broken. Thanks! 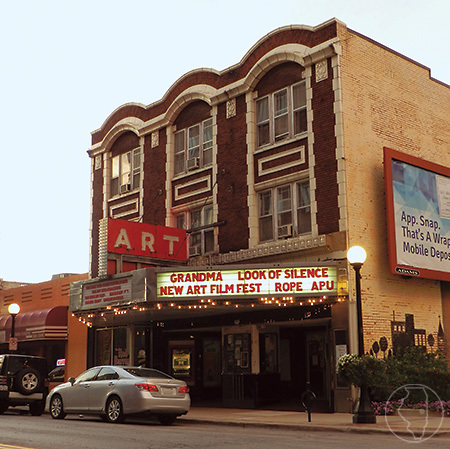 CHAMPAIGN, IL (May 25, 2017) – After a twenty-day voting period, the cooperative owners of the Art Theater have approved a merger with the Art Film Foundation (AFF). Owners overwhelmingly approved the merger, with 97 percent of the voting ownership pool approving. The merger will dissolve cooperative ownership, bringing the Art into the fold of the AFF and conferring onto the theater tax-exempt charitable status. The Art’s programming, staff, membership program, and daily operations will remain unchanged, but it will now be legally capable of soliciting tax-deductible funding from individuals, businesses, local and state foundations, and national non-profit arts funding organizations. The AFF is a Champaign-based 501(c) (3) tax-exempt charity founded in 2015. Its mission is to promote culture and education through film and cinema. Post-merger, the current Art Theater Board of Directors will be appointed to the Board of the AFF. “Merging the two boards together ensures stable leadership during the transition and provides a continued focus on incorporating community voices into the leadership of the theater,” says Leigh Estabrook, the current president of the Art Theater Board of Directors. This entry was posted on Wednesday, May 31st, 2017 at 12:00 pm	and is filed under News du C-U, Preservation, Theatres & Venues. You can follow any responses to this entry through the RSS 2.0 feed. Both comments and pings are currently closed. 14 distant relations of Jan Tschichold dissected this page in 0.381 seconds while exacting sweet revenge in silence.